Employee involvement is creating an environment in which people have an impact on decisions and actions that affect their jobs. Employee involvement is not the goal nor is it a tool, as practiced in many organizations. Rather, it is a management and leadership philosophy about how people are most enabled to contribute to continuous improvement and the ongoing success of their work organization. A solid recommendation for those organizations that wish to create an empowering, continuously improving workplace is to involve people as much as possible in all aspects of work decisions and planning. This involvement increases ownership and commitment, retains your best employees, and fosters an environment in which people choose to be motivated and contributing. 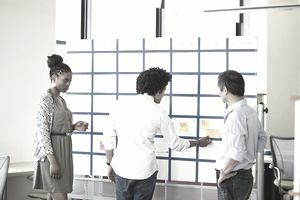 How to involve employees in decision making and continuous improvement activities is the strategic aspect of involvement and can include such methods as suggestion systems, manufacturing cells, work teams, continuous improvement meetings, Kaizen (continuous improvement) events, corrective action processes, and periodic discussions with the supervisor. Intrinsic to most employee involvement processes is training in team effectiveness, communication, and problem-solving; the development of reward and recognition systems; and frequently, the sharing of gains made through employee involvement efforts. For people and organizations who desire a model to apply, the best was developed from work by Tannenbaum and Schmidt (1958) and Sadler (1970). They provide a continuum of leadership and involvement that includes an increasing role for employees and a decreasing role for supervisors in the decision process. The continuum includes this progression. Tell: the supervisor makes the decision and announces it to the staff. The supervisor provides complete direction. Sell: the supervisor makes the decision and then attempts to gain commitment from staff by "selling" the positive aspects of the decision. Consult: the supervisor invites input into a decision while retaining authority to make the final decision herself. Join: the supervisor invites employees to decide with the supervisor. The supervisor considers her voice equal in the decision process. Delegate: the supervisor turns the decision over to another party. In a study, "The Impact of Perceptions of Leadership Style, Use of Power, and Conflict Management Style on Organizational Outcomes" by Virginia P. Richmond, John P. Wagner, and James McCroskey, the researchers developed an instrument to measure employee satisfaction using this continuum (tell, sell, consult, join). Their research discovered that "the supervisor who wishes to generate a positive impact on satisfaction with supervision, satisfaction with work, and solidarity and to reduce communication anxiety should strive to get her/his subordinates to perceive her/him as using a more employee-centered (consult-join) leadership style." At the same time, however, the supervisor cannot be seen by employees as abdicating responsibility for decision making. The authors further concluded, "we believe there is a relatively straightforward explanation of this finding. Leadership styles which approach the employee-centered (join) end of the continuum greatly increase the degree to which subordinates are asked to participate in making decisions and/or make the decision themselves. "When this approach becomes excessive, the supervisor may be seen as abdicating her/his responsibilities—the laissez-faire leader—or even deserting the subordinate. The subordinate may feel that they are given more responsibility than their positions should require and, thus, are overworked or underpaid for the work expected. Such reactions could be expected to be reflected in negative outcomes of the type observed in this study. "We conclude, therefore, that while the supervisor should attempt to be perceived as employing an employee-centered leadership style (consult-join), he/she must maintain a supervisory role and avoid being perceived as abdicating responsibility." Reference: Tannenbaum, R. and Schmidt, W. "How to choose a leadership pattern." ​"Harvard Business Review," 1958, 36, 95-101. These are the examples of each stage of delegation in action. Tell: Useful when communicating about safety issues, government regulations, decisions that neither require nor ask for employee input. Sell: Useful when employee commitment is needed, but the decision is not open to employee influence. Consult: The key to a successful consultation is to inform employees, on the front end of the discussion, that their input is needed, but that the supervisor is retaining the authority to make the final decision. It is the level of involvement that can create employee dissatisfaction most readily when this is not clear to the people providing input. Join: The key to a successful join is when the supervisor truly builds consensus around a decision and is willing to keep her influence equal to that of the others providing input. Delegate: The manager asks a reporting staff person to take on full responsibility for a task or project with specified feedback dates as the manager remains ultimately responsible for the goal accomplishment.